My daughter was born 16 years ago, June 4th, a Sunday. Two weeks later, was Father’s Day. Having never been a father on Father’s Day, I took it easy. I’d finished the manuscript of my first book, but hadn’t heard from my editor (I forget nothing, Bill! ); I had no prospects and we were near broke. What to do with a Father’s Day like that, overcast but warm, a thawed turkey, a six pack, no prospects, an exhausted but wonderful wife, and a two-week-old? Fire up that grill on the back porch, open a beer and spend three hours watching a turkey cook and a baby sleep. My mom was in town and my dad arrived—“I’m giving you a gift because it’s your first father’s day and I want to, but don’t expect one next year.” He was kind of pissed at himself for giving in. I understood. He was a practical man. His dad died when he was younger than I at the time. My dad, so practical, so sweet. And that turkey. The best I’ve ever had. Best. EVV-er. I built a Johnny Cash in the Weber, put a drip pan in the middle, and cooked it easy all day, getting pleasantly tipsy, getting kisses from my wife, my mom cooing over her first grandchild. My dad arriving with a gift for me, kissing his ex-wife (best of friends and really still married at heart; neither would remarry), and a perfectly grilled turkey. I mean, perfect. We stood around picking at it, eating it standing, and asking ourselves why don’t we do this all the time? Why doesn’t everyone? This is so so good. In a month I would come up with an idea to wangle my way inside the CIA and learn how to cook and try to write about it. But that day, the turkey, I just got lucky. I’ve since learned though that turkeys, like some fathers, are generous indeed. I’m going to try to do a grill post every Friday since cooking over fire is in my nature and it’s something people love to do generally. And I’m starting with grilled turkey because people, 1, don’t cook it nearly enough (why is it relegated to winter holidays and the deli counter? ), and 2, because turkey lends itself so well to grilling. The smokey grilled flavor is intense and gratifying. I submerged mine in a brine; a great idea if you have the time. I needed 8 liters and 400 grams of salt (thank you Ratio App! ), an onion, sage, bay, garlic, pepper (see more on brining here). I spatchcocked it just like a chicken, cut up the back bone and roasted it with the neck, heart and gizzard for a roasted chicken stock, thickened with roux for a simple gravy (see spanker video). I built a ring of fire around the grill and put a foil-encased cake pan in the center to catch the fat, and basted it throughout with a sage butter sauce. The legs take longer than the breast so you can cook the turkey all at once, what I like to do, and did on Father’s Day with the above bird, was to take the legs off and finish them in the oven just letting the breast rest, rewarming it with the legs while finishing the risotto and salad and serving. Prepare your fire as noted above. Using a chef’s knife, cut through the turkey on either side of its backbone to remove it (I did this a day before cooking and used it to make a stock). Press the turkey down to flatten the bird. When the fire’s hot season your turkey aggressively with salt and pepper if you didn’t brine it (if you did, no seasoning is necessary here). Put it skin side up in the center of your grill. Put the lid on, vents open. To make the baste, put the lemon juice in a small sauce pan over high heat. Once it’s warm, 30 seconds or so, add a chunk of butter and swirl or whisk the butter. Once it begins to melt, add the remaining butter and continue to swirl or whisk until it’s completely melted. Take it off the heat and add the remaining ingredients. Stir to combine over medium heat just to warm all the ingredients. Set aside. Grill the turkey for 2 to 3 hours, beginning to baste after the first hour. Add more coals to the fire if necessary (I did). If you want to judge doneness with a thermometer, take the turkey off the grill when the breast reads 145 to 150 degrees F.
Remove the legs and put them in a 250 degree oven for another 30 to 60 minutes. Don’t worry about the breast and wings. Put the breast back in the oven with the legs for 10 minutes to warm the exterior. Ours served 5 for dinner then a leftover dinner for 4, 2 turkey sandwiches later in the week, and more stock. Blogger Chadzilla shares his two cents on the bell jar pie fad. Recipe for grilled halloumi cheese and meyer lemon from Jen of the Tiny Urban Kitchen. Learn more about heritage breeds of turkey through the Heritage Turkey Foundation. A lovely reflection of times gone by. You can just feel the love and contentment in your words. The only question is if you made stock with the carcass. froze bones for big batch of poultry stock later. … interesting thought…mixing turkey and chicken parts…anything else to make it out of the ordinary ? Unique aromatics maybe ? Beautiful post and a reminder of what’s so great about summer cooking, and grilling specifically–the ease and simplicity of it, and the social aspect of it as well. Have never considered grilling a turkey but this looks awesome and definitely something we will have to try! I cook a turkey breast once a week, (since i gave up deli meat), and did cook it on the grill once and loved it. My stupid question? How do you add more coals to the fire? I guess the turkey has to come off the grill at that point? i bought those towels from your open sky shop 🙂 i will try it today, planning on grilling my turkey breast along with the steak tips i bought my boys. thanks! Will be deep frying one on Sunday, unless it rains, in which case it will be a pair of thick Porterhouses on the stove top grill. 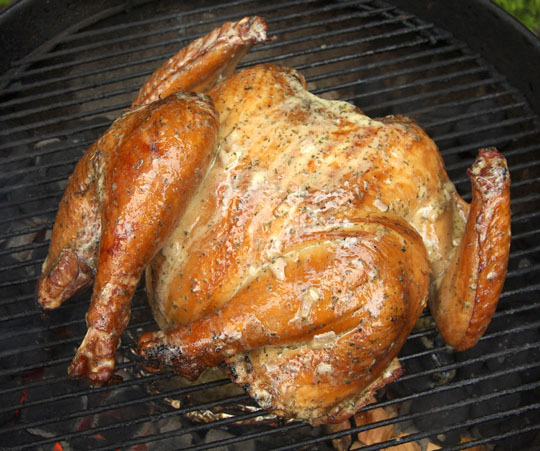 Done this to chicken, I’ve both grilled and smoked turkey, but not using this method. careful! biggest cause of thanksgiving house fires! This is a pretty beautiful post, Michael. And I’m not even really talking about the turkey. I love your writing. I’ve made spatchcocked chicken at least once a month during the summer since you first posted about that method. Now I HAVE to try turkey (w/o the sage part). Perhaps thyme or marjoram or savory. Any suggestions? any garden herb will work, marjoram, savory, but especially tarragon. Ooooh tarragon! Love, love, love tarragon. Dislike sage immensely though it is a beautiful plant and I grow it every year (for the looks). Thanks Michael. +20 points to Gryffindor for the superb Ring of Fire reference. And the suggestion to spatchcock a turkey. The gauntlet has been thrown down. Sounds fantastic. Do you have to keep adding coals? If so, how often? i added once, after an hour. Can I do this turkey on a natural gas grill? I suppose on the indirect side. I just can’t manage a charcoal grill. It’s really tricky to do whole birds over gas grill, you can try it, searing it then moving to the indirect side. I’m not a fan of gas grills, lacks flavor and control. I’ve made quite a few spatchcocked birds on my gas grill. I typically sear the meat skin side down for 5 mins over hottest burners, then flip it skin side up and move to indirect heat (or you can lower the gas to med/low) until just about fully cooked, then flip once more skin side down over high heat to give the skin a final crisping. An easy way to add flavor on a gas grill is to put a small packet of soaked wood chips in a foil pack and dropping it onto the hot part of the grill. The key is to use a small amount of wood because you want smoke as a background flavor, not a dominant one. Wonderful sentiment, and the bird looks delicious. If only they hadn’t outlawed grilling at my apt complex. 🙁 I miss grilling. It’s too much of a PITA to haul coals, food, utensils, plates, all the picnic stuff, etc to a park on any sort of regular basis, it takes an hour just to load the damned car. I do a butterflied/spatchcocked turkey in the oven for Thanksgiving every year and it comes out great. Seems perfect for nice even cooking in the grill. Just a warning to people who want to do it: turkey bones are a lot thicker than chicken bones, and thus it’s a lot harder to get the backbone out of a turkey than it is a chicken. You’ll want a really sharp Chefs’ knife or… better yet… a heavy cleaver. I like poultry shears for this task. I’ve been BBQing turkey for years and agree it is the best way. Like a good dog, a brined turkey is very forgiving. I always use some applewood or hickory soaked over night to add smokey goodness. +1000000 for the Johnny Cash reference. Can I cook it on a gas grill? If so, what temp do I keep it at? Man, that’s a great story. You had me at “black as tar” but I will say the johnny cash reference took me a minute. I’ve been grilling turkey for thanksgiving for years now. Recipe is the same (Weber’s orange sage and clove turkey) but it gets better every year. B.) I made a turkey on the barbecue last year for Mother’s Day with a similar butter and sage baste and it was delicious and had a crisp, brown, crackling skin. My Weber grill is old so my grate doesn’t have hinges on the sides. I just use the Sunset magazine method and add a couple of cold coals to each side with tongs through the handle holes every 15 minutes. It works like a charm for me. Isn’t it funny how certain herbs are so polarizing? Me, I adore sage but don’t care for thyme or most of the anise-flavored herbs much– the exception being basil. I love basil! Go figure. Great article. Question about the legs, are you talking about removing legs/thighs to finish in the oven or just the legs. Please can you tell me the brand and model of your grill? I’ve never grilled or had a grill (thinking of getting one though! ), and was wondering what you have. “cooking this on a gas grill will only be moderately better than microwaving it” Thats ridiculous! Cooking it on a gas grill with give you much more flavor then in the oven. As the drippings vaporize below a grill flavor develops. Add a foil pouch with some wood chips on top of the burner: Not as good as on my smoker but damn better then in any oven! Everyone’s talking about the turkey and I’m dribbling at how far you’ve come in 16 years. Thanks for an inpiring peek into how you came to be who you are today. Cream always rises to the top, my dad always said. Now about this turkey – it looks divine. I never eat turkey without feeling American. Turkeys in Australia are the size of a large chicken and cost a fortune to buy – think $50. Americans here still buy them, regardless the price. I am going to give this method a try. Ahh that was such a sweet story about the baby and the turkey and your folks. Brings back so many memories of my own youth, baby, parents. Still sighing. Loved the story. When we did some remodeling many years ago, we bought a gas grill w/side burner to use as our kitchen while it was torn apart. It was the smartest move we’d made in preparation for the long process. We did our Thanksgiving turkey in it, just as if it were our regular oven and it was outstanding. But you’re right, it didn’t have any smokey flavor, but then again, we roasted it in a roasting pan on a rack. We’ve done it several times since to free up oven space on the big day. Thanks for the info on spatchcocking a big bird, will try that next time we have a turkey. I am in such a food funk that every word of this post makes me want to cry like a baby except the part about the turkey…how does one get out of the frame of mind that does not want to eat or cook? Is there any merit in removing the rib cages, as well? Similarly, will making cuts in the leg joints and pounding them down a bit help with the timing issues? Lovely story! The spatchcocked turkey looks divine! I’ve only spatchcocked a chicken for the grill, but will used your technique for my next grilled Thanksgiving turkey. I often add hot water to the pan while grilling as turkey tends to dry out. Is this necessary? Very nice post and great timing, as I’m doing a spatchcocked turkey (we’ve always called it butterflied) today for my son& his family when they come over for the 4th. I watched the grilling demo video too, and really liked the grill you were using then. Do you mind sharing what kind that was? I’m going to need to replace mine soon and am working on a short list of possible candidates. A big green egg makes this real easy. It can hold a burn for a few hours, no need to add coals! I literally JUST got a new Weber. The ash catcher is a miracle, and the grate opens so you add coals to the side. I was very proud for putting it together on Saturday afternoon all by myself with directions that I could not fathom. And on July Fourth I am happy to report that I cooked a butterflied leg of lamb that turned out great. So I will give this turkey a try – it does look delicious – and will check your Friday grilling recipes weekly. You know years ago one Thanksgiving we had a brand new gas grill and Mom decided to fix the large turkey 25 lbs on the gas grill and bake in the house, well I tell you I know yours was great because that was the absolute best turkey ever, moist not dry best flavor. We loved it ! Thought ours was stuffed with oyster dressing as usual, even that had the best flavor of any we ever fixed. Can you use a gas grill for this? And if so what needs to be done differently?